March 16 - 17, 2012 Supernova Hub workshop: "Photometric Identification of Supernova"
July 23 - 27, 2012 9th International Conference "Identification of Dark Matter"
October 18 - 20, 2012 Sackler colloquium: "Dark Matter Universe: On the Threshhold of Discovery"
Plan for NASA Participation on the Extreme Universe Space Observatory onthe Japanese Experiment Module, the JEM-EUSO mission. 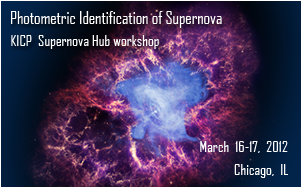 Supernova Hub workshop: "Photometric Identification of Supernova"
The workshop will focus on methods for identifying type Ia Supernvae (SNIa) without spectroscopy. The emphasis will be on using these photometric SNIa for Hubble Diagram analyses in PannStarrs, the Dark Energy Survey (DES) and the Large Synoptic Survey Telescope (LSST). Argonne, Fermilab and KICP will host a one day Chicagoland and Midwest Dark Matter Workshop with the goal of bringing together the collider, indirect and direct DM communities. The workshop is geared towards persons interested in Dark Matter who live within a 4-5 hr drive of Chicago. The workshop will be held in the Curia II conference room in Wilson Hall at Fermi National Laboratory. * What are the strengths and weakness of each approach to DM? * Where do the different approaches complement each other in a way that provides more information than each individually? * What are the prospects for making progress with each technique over the next decade? * How can we build a larger community that can argue effectively for DM experiments leading up to the Snowmass 2013 meeting? Dan Bauer, Karen Byrum, Juan Collar, Dan Green, Salman Habib, Dan Hooper, Alexander Paramonov, Carlos Wagner, Ben Zitzer. The Kavli Institute for Cosmological Physics (KICP) at the University of Chicago will host Non-Gaussianity Hub workshop on April 19-21, 2012. We plan to bring together theorists and data analysts in this 3-day workshop on non-Gaussianity to consolidate the recent progress and discuss future efforts. We expect attendance by about 30 worldwide leaders in the field of non-Gaussianity. * How would the systematics enter? * What about inflationary input? 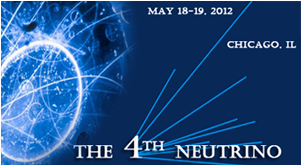 The 4th Neutrino workshop will take place from Friday May 18th to Saturday May 19th in Chicago, IL. The workshop is being hosted by the Kavli Institute for Cosmological Physics (KICP) in the Laboratory for Astrophysics and Space Research (LASR) building at the University's of Chicago main campus in Hyde Park. 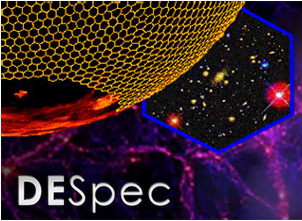 The Kavli Institute for Cosmological Physics (KICP) at the University of Chicago will host The Dark Energy Spectrometer workshop on May 30-31 to discuss DESpec, a conceptual next generation dark energy project to enable massive spectroscopic surveys in the southern hemisphere. It would naturally synergize with the Dark Energy Survey (DES), which will start taking data later this year, and with LSST in the longer term. The goal of this meeting is to review past and present work on DESpec and to make plans for how to proceed. We will briefly review the current state of the instrument design and then identify the next steps in the project, including describing the R&D necessary to proceed with theory, survey strategy, and instrument definition. The goal of the workshop will be to begin to assemble the DESpec team, define the project's mission statement, and plan how to proceed in the coming year. 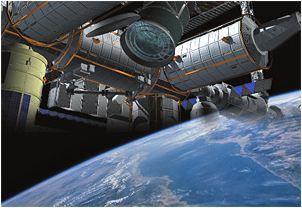 The Kavli Institute for Cosmological Physics (KICP) at the University of Chicago will host a Summer School on Dark Matter Detectors from July 11th to July 21st 2012. The aim of the School is to expose a select group of 15 to 20 graduate students to the challenges of designing, building, and operating both current and future dark matter detectors for searches conducted at underground laboratories. The School will provide the students a full-immersion, hands-on experience, with several labs exploring experimental techniques for dark matter detection. Planned experiments that students will be able to perform include: calibration of photon detectors, characterization of ultra-pure Germanium detectors, radiopurity determination through spectroscopic measurements, the art of fighting electronic noise, shielding techniques, measurement of a scintillator's quenching factor, particle detection with a bubble chamber and CCDs, and measurement of electroluminescence in noble gases. Data acquisition and simulation techniques will also be covered. The School will be held in the Laboratory for Astrophysics and Space Research (LASR) at the University of Chicago. 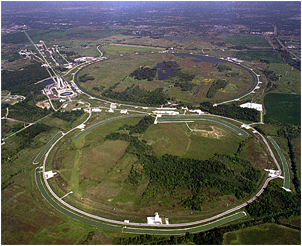 A visit to Fermi National Accelerator Laboratory (Fermilab), where the students will become familiar with noble liquid, bubble chamber and cryogenic detectors, is also included. 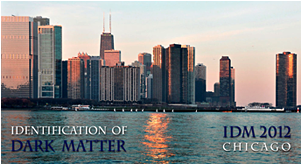 9th International Conference "Identification of Dark Matter"
The Kavli Institute for Cosmological Physics (KICP) at the University of Chicago will host the 9th International Conference "Identification of Dark Matter, 2012" in Chicago, USA on July 23-27, 2012. The conference will take place in downtown Chicago at the Holiday Inn Mart Plaza. The conference will include both invited and contributed talks as well as a few more specialized sessions. Instructors: Alissa Bans, Juan Collar, Nicole Fields, Dylan Hatt, Sean Johnson, Chris Kelso, Randy Landsberg,Reid Sherman, Kyle Story. 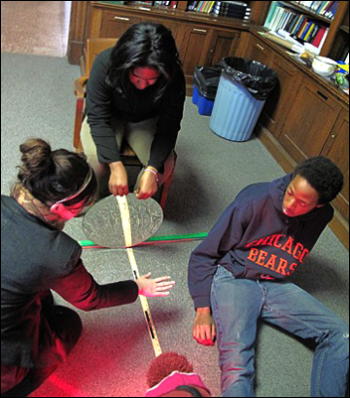 The Yerkes Summer Institute (YSI) is a week long, residential, science camp for inner-city high school students in the Space Explorers Program. In addition to providing the students a science immersion experience, it offers many teaching, curriculum design, communications and team working opportunities for the instructors, who are generally early career scientists. YSI 2012 explored destructive testing as a tool for understanding stress, strain, and safety devices. In each lab, students studied the basic physics underlying a device, designed their own device, and then employed destructive testing to improve their designs. Monday through Wednesday, students cycled through three different day long laboratories, which examined bridge failure, crash tests, and the effects of earthquakes on structures. These daytime activities lead to two days of extension activities in which groups of students further investigated a lab and prepared a presentation on their findings for their parents and peers. Nighttime activities focused on observations with the Yerkes Observatory telescopes. In the "Spanning the Gap: Bridges" lab students studied the fundamentals of bridge design, especially how bridges accommodate loads (static stresses). They designed and constructed their own bridges, which they then stress tested by loading with progressively more weight, until they failed. Finally, the students applied what they had learned from the failure modes to build better bridges. The "Humpty Dumpty: Crash Test" lab investigated the extreme stresses that occur during a car crash using a pinewood derby car with an egg as a proxy for a passenger. After exploring impact stress, stopping distances, deceleration and how seat belts, airbags and crumple zones lessen damage, the students designed safety devices to protect an egg during a derby car crash test. Although none of the initial student designs were successful, by experimenting with different seatbelt and airbag configurations, the students iteratively improved their designs until they were able to keep their egg passengers safe. During the "Quaking Towers: Shake Table" lab, students investigated strategies employed to help buildings withstand the powerful dynamic stresses of an earthquake. 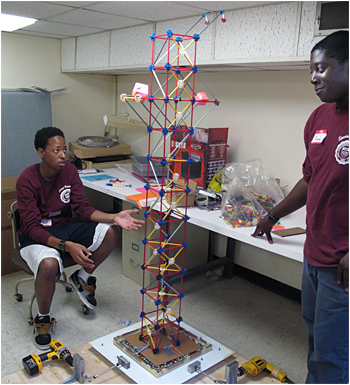 They then designed and constructed "earthquake resistant" model sky-scrappers, using an evolved form of Tinker Toys called K'nex. These model buildings were tested on a homemade shake table, which simulated earthquake conditions. The dynamic stress tests were documented via video, and careful frame-by-frame analysis helped the students to determine where and how their buildings had failed, which lead to improved designs. "I love this experience and it really helped me learn more things about science and things in general." "I really enjoyed this trip because I learned a lot about how to improve buildings, cars, and bridges. You cannot just build something in a little amount of time." "I think it was a fun experience. I learned a lot about ways of improving everyday things that I had never thought about." However nice and neat this picture is, it remains full of unknowns. 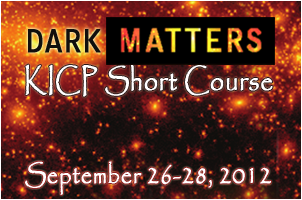 This short course will explore in depth one of the major mysteries on which this model rests: dark matter. It will provide you with the current big cosmological picture, gritty details of the on going searches for dark matter, stories from the forefronts of research and resources that will help you to bring dark matter back to your home institution in a meaningful way. You will meet the individuals behind the headlines and the course format will provide abundant time for informal interactions with them and your peers. Beyond the big picture and how dark matter fits into this picture, we will delve much deeper into this mysterious stuff that comprises almost a quarter of the universe. We will explore the evidence for the existence of dark matter, what models and experimental evidence point to as potential candidates for the particles that compose dark matter, and how dark matter might be detected. 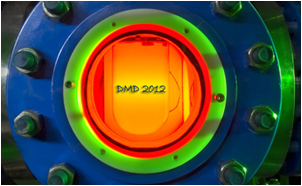 Dark matter detection and detector hardware will be a special focus of this course. We will explore direct detection, indirect detection, accelerator searchers (i.e.., producing it in an accelerator and then detecting the decay particles) and the hardware that makes these searchers possible. 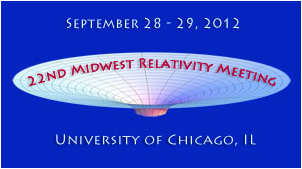 The 22nd Midwest Relativity Meeting will be held Friday and Saturday, September 28 and 29, 2012 at the University of Chicago. The format of the meeting will follow previous regional meetings, where all participants may present a talk of approximately 10-15 minutes, depending on the total number of talks. We intend for the meeting to cover a broad range of topics in gravitation physics, including classical and quantum gravity, numerical relativity, relativistic astrophysics, cosmology, gravitational waves, and experimental gravity. As this is a regional meeting, many of the participants will be from the greater United States Midwest and Canada, but researchers and students from other geographic areas are also welcome. Students are strongly encouraged to give presentations. The Blue Apple Award, sponsored by the APS Topical Group in Gravitation, will be awarded for the best student presentation. We gratefully acknowledge the generous support provided by the Kavli Institute for Cosmological Physics (KICP) at the University of Chicago. Sackler colloquium: "Dark Matter Universe: On the Threshhold of Discovery"
The dark matter problem today is central to astrophysics, cosmology and particle physics. The leading particle candidates for the dark matter are the Weakly Interacting Massive Particle or WIMP and the ultra-light axion. The WIMP is strongly motivated by supersymmetry and detectable by three separate means: production at a particle accelerator, direct detection of the WIMPs that comprise our Galactic halo, and indirect detection by the annihilation products of WIMPs. With the ramping up of LHC operations, the increased sensitivity of direct detection experiments and new "telescopes" like Fermi Gamma-ray Space Telescope, Alpha Magnetic Spectrometer AMS, IceCube, and the Payload for Antimatter-Matter Exploration and Light nuclei Astrophysics PAMELA that can detect WIMP annihilation products, the next decade is set to be the time of truth for the WIMP hypothesis. Foreshadowing this, there have been recent claims of detection by both the direct and indirect methods spurring new theoretical ideas, much discussion and productive confusion! This timely symposium will bring together the astronomers and physicists, the observers and the experimenters, the phenomenologists and the theorists to assess the present situation and plan for the future. Lab Instructors: Dylan Hatt, Alissa Bans, Juan Collar, Walter Glogowski, Randy Landsberg, Tongyan Lin, Sean Mills, and Denis Erkal (lab development). In the Critical Flicker Factor lab the students investigated the differences between rods and cones, the two types of photoreceptors within the eye; this included the perception of color and detail, and the minimum response time to notice a changing stimulus. The Stop Motion Video lab explored this finite response time and how it influences our perception of motion. In the lab, students determined the limits of frame rates and applied this to the creation of stop-motion videos based on scientific principles and phenomena (see videos). While human vision encompasses only a small portion of electromagnetic spectrum, some animals can take advantage of a greater range, which students studied through experiments with the infrared and ultraviolet in the Alien Vision lab. Poor weather did not permit telescope observations but everyone enjoyed other evening activities including a video showcase of the students' own stop motion productions. Nineteen (19) Space Explorers and seven (7) instructors were in residence at the Institute, and thirty-five (35) parents, siblings and family members joined the last day of the institute for the student presentations and the closing ceremony. "That I learned about my eyes and I know how they work"
"[Most Valuable] Learning about everyday things we take for granted"
"I learned that cones are for the day time and rods are for dim or dark light"
"I really enjoyed the whole thing, but I just wish that we could have been able to look out the telescopes." "I enjoy coming to Yerkes to learn about science." There are many parts of the eye that allow us to see the way we do, but the ability to see light depends on biological detectors within the eye. There are two main types of detector cells. The cones allow us to see the bright and colorful world during the day, and the rods allow us to find our way at night when it is dark. In this laboratory, we will discover how our perception of the world changes based on whether it is light or dark and how the eye switches between one tool of vision to another. In this lab we will explore how one can make still images look like they are moving. We will use a zoetrope, a mechanical precursor to a movie projector, to examine the limits of when still images appear to move and when they do not. Finally we will create our own stop motion movies. You will be the writer, producer, director and possibly star of these short motion pictures with a point. What if you could see the world in a whole new light? Not just a new perspective, but literally, what would the world look like if we could see outside the normal boundaries of human vision? While our unaided eye can only detect a small range of light, with technology we can detect light spanning from radio waves to gamma-rays! In this lab, not only will we be experimenting with how objects appear in these exotic forms of light, but we will also demonstrate that even though this light is invisible to your eye it shares the exact same properties of visible light. We will use these properties to "see" the invisible and learn a little bit about what it would be like to have alien vision!